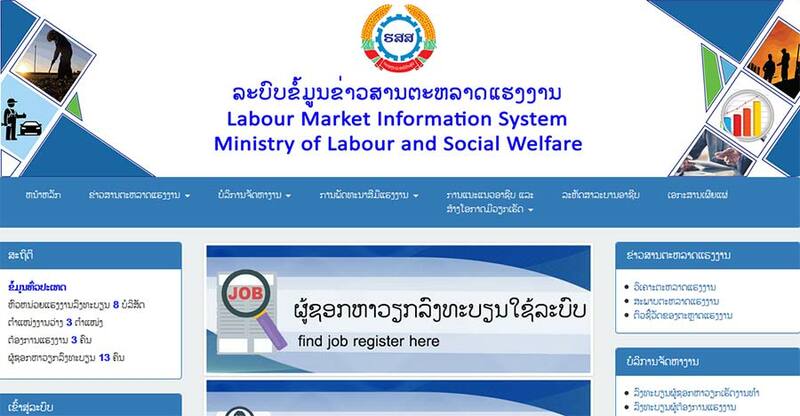 VIENTIANE - Lao businesses will soon be able to access crucial information via a government-owned website that will also provide updates on job opportunities and other useful data regarding the demand and supply of labour. Last week, the government-run Employment Service Centre, in collaboration with the Lao National Chamber of Commerce and Industry (LNCCI), co-hosted a workshop to introduce the newly established website, www.lmi.molsw.gov.la, to business operators. The website, to be officially launched in 2018, will provide better access to information that will meet the demands of the public and employers in public and private business units. It will provide a free service for job seekers who can apply for jobs online via the website. Deputy Director of the Employment Service Centre, Mr. Bounkham Sihalath, told Vientiane Times on Friday that the centre is a bridge between employers and employees. “On behalf of the government, we are responsible for the management and service of job conscription as well as for providing information about opportunities domestically and internationally,” he said. He said the website would be a tool for applying for jobs online and provide information related to demand and supply in the labour markets of Laos. “Currently, we are working on website assessment to find out how many individuals are interested in accessing the labour market via the website. But personally, I’m confident that it will help both employers and job seekers to access the required information online in a much easier way,” Mr Bounkham said. Deputy Secretary General of the LNCCI, Ms. Daovading Phiraxayphithak, said this is part of the government’s efforts to promote access to information. Business operators had raised questions at the recent Lao Business Forum about the difficulty in accessing accurate data on labour markets. “This workshop on the dissemination of labour market information through the website is a timely response to the demands of employers. Of course, discussions and friendly conversations are fully encouraged in this platform to ensure a clear understanding by the business sector prior to the Lao Business Forum in 2018,” she added. Businesses face limitations in accessing both finance and information about the job market. The Employment Service Centre works as a secretariat division of the Ministry of Labour and Social Welfare to facilitate and legalise domestic workers in foreign countries and to manage foreign workers in Laos.